In a white landscape is a dream. It is illogical and indescribable. The body is densified, vibrates. Finds way there, find a way home. We turn the page. In a white room, an empty body, blurred. The dream is spreading. The performance is about an investigative body and the floor. Body Poetry is in button dance capable of expressing a poetical and illogical part of reality. Body Poetry is also inspired by the poetic dance form Butoh-fu. Butoh dancer’s expressions are born through an embodiment of choreographic material, such as tree twisting force, a process of decay, water drops, lightning, the flower that emits fragrance particles and so on. 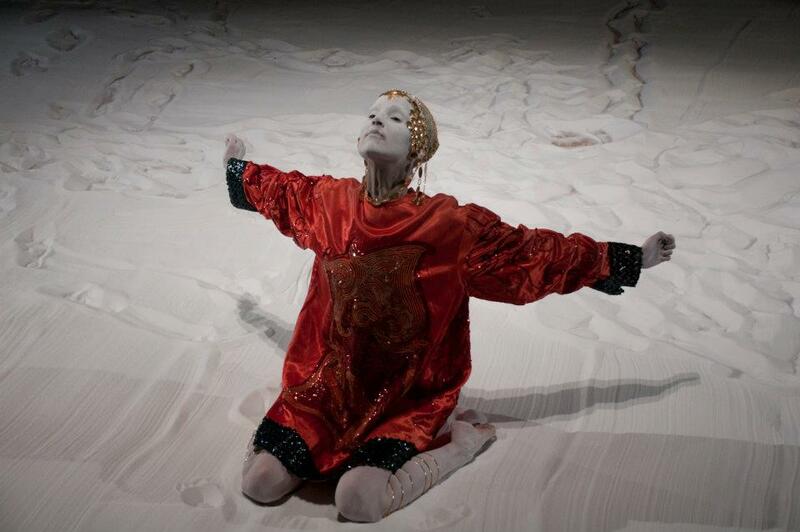 Butoh-fu is visual and poetic images used to create the structure of the dance. Butoh-fu can also be words that are similar to poetry. Frauke is one of the hardest working choreographers right now. Just a month after the permiere performance of the Endangered at Atalante she presents a whole new piece at Lokstallet Stromstad. Frauke is based in Gothenburg, but also working internationally. In 2010 and 2011 she received awards from The Standard Bank Ovation Award and The Sunday Independent for his participation at the Dance Umbrella in Johannesburg and the National Arts Festival in Grahamstown, South Africa.